Ryan Verdon is converting the old Menomonie Railroad Station, 621 Fourth St. W, into a beer and hang-out venue slated to open in late October, while Jonathan Christiansen refinishes the interior of the former Dennis’ Auto Service, 624 Main St. E, for an earlier October launch. Verdon is a lifelong Menomonie resident with more than a decade of brewing experience. He worked for Rush River Brewing for several years while he pursued a degree in food science at UW-Stout. In 2014, he assisted with the opening of Real Deal Brewery. Moved by his desire for an independent lifestyle and the oft-repeated community wish that the railroad station be repurposed, he bought the century-old building to house Brewery Nonic and began renovations in February. Brewery Nonic will focus on English beers, which are lower in alcohol but offer full, rich flavor profiles. “I like beer,” Verdon said. “I want to be able to have more than one and still make it home.” He intends to work with local farmers to craft his beverages, and has plans to partner with 52 Bakery to offer tasty breads and pretzels. He will also invite food trucks to provide meals to bargoers on a regular basis. The former railroad station is spacious, with high ceilings and a covered outdoor space. Verdon has worked to preserve elements of the building’s historic design, repurposing sections of wainscoting to decorate the bar, and freshening the paint using original colors. “The beer is number one, but the place, the people, and a lot of those intangible things are what make the experience really valuable,” he said. Zymurgy, Christiansen’s brewery, is taking a more modern approach both in atmosphere and brewing style. Christiansen, who attended the Siebel Institute (a brewing school in Chicago) and helped open two breweries over the course of his career, plans to take a “fly by the seat of his pants” approach, exploring flavors ranging from Belgian beers to honied weisses made with local ingredients. 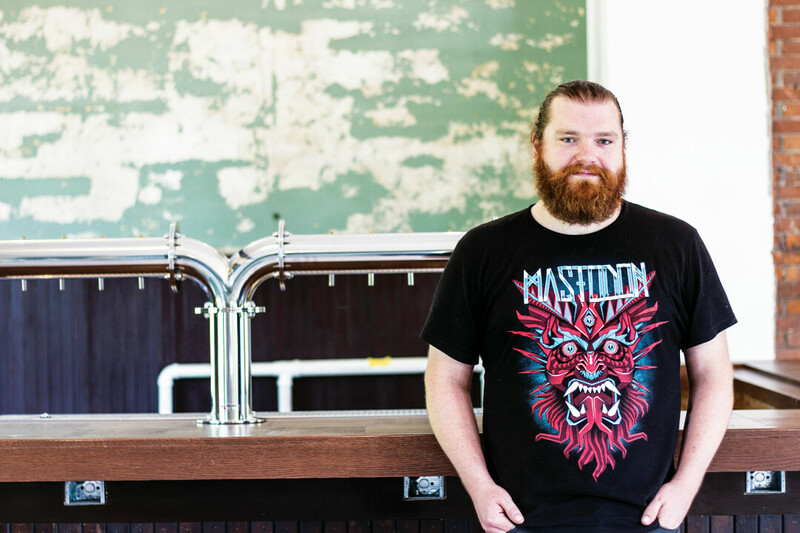 With 15 taps ready to pour behind the raw-edge bartop, Christiansen plans to offer a range of his own brews, a few guest taps, and ginger ale and kombucha. Crowlers (fillable beer cans) will also be available. Eventually, he plans to work with Chelsea Rickert to offer a range of fermented foods that will complement the beverage selection. Christiansen opted to keep the shop’s teal and white metal-panel walls, a fun contrast to the wood-grain counter and tabletops. Barstools in red and yellow add a pop to the design. Two televisions will be used to show Wisconsin sports and live-streamed concerts. In time, Christiansen intends to offer brewing classes, add a stage for live performances, and host a bier garden in the large parking lot. Christiansen and Verdon, good friends since Christiansen moved to Menomonie in 2010, have leaned on each others’ experience during the process of opening their ventures. 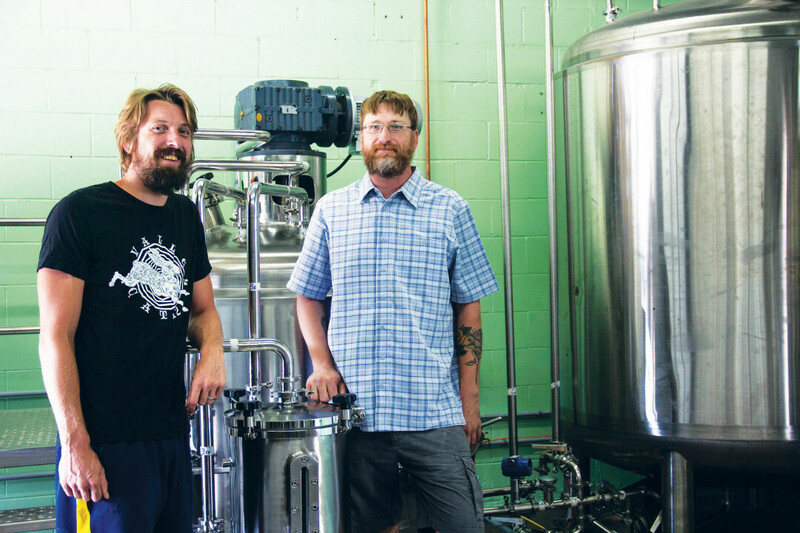 They discussed their brewing techniques, renovation challenges, and many other details of becoming independent business owners over the years it took to reach this point. “For most cities in the brewing industry, it’s ‘the more, the merrier,’ ” Christiansen said of the pair of breweries opening on such a similar timeline. “If you want to come to Menomonie and do breweries, now you have three of them,” he added, referring to Lucette Brewing Co., which opened in 2010. Each location offers something a little different, he said. Zymurgy and Brewery Nonic are slated to open during the fall of 2018. For more information, check out zymurgybrew.com and brewerynonic.com.